I was too busy last month to update my net worth spreadsheet or post a blog entry. Busy at work, and also busy getting my second eye operation done. I was up at my 'hobby farm' last week (didn't get much done while there, as I'd hurt my foot falling off our patio the week before! 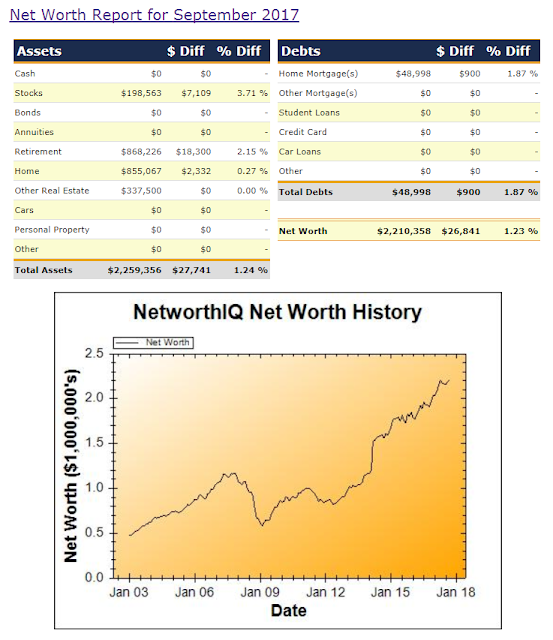 ), so had a relaxing time and only just got around to doing a belated 'monthly' net worth calculation and updated networthiq with the figures. The stock market improved during the past two months, so my geared share investment portfolio and retirement savings (SMSF) balance both improved during August and September. The estimated valuation for our house also continued to rise in August, but showed only a slight gain in September. I won't be surprised to see Sydney real estate prices stagnate or fall slightly over the next couple of years (especially home units, of which there seems to be a 'glut' developing). DW is still looking for work, and so she decided to sell her brand new apartment after not having being able to find a tenant during the month immediately following 'settlement'. Fortunately, soon after listing the unit for sale, there was one seriously interested buyer, who has now paid a 5% deposit and exchanged contracts (but also asked for a 12-week settlement period - the normal settlement period is 6 weeks). Hopefully the sale goes through without any problem. If so, DW will have realized a profit of around $100K, which she intends to contibute to her superannuation savings. That way, even if she only has a series of casual jobs for the next ten years (until 'retirement age') she will have already accumulated enough to self-fund her retirement (assuming future stock market returns meet our expectations).